The cool thing about homeschooling is you can take a step back from a frustrating assignment, take a deep breath, and think about what you’re trying to teach. Is the assignment as written the best possible way to do that? Or is there a better way to achieve the goal. Wyatt can be exceptionally challenging. Most of the work comes way too easily for him, but there are a couple of things that send him straight into a complete system shut down. First, he’ll drop his head onto the table, then he’ll mumble I need a rest. Finally, he shuffles into his room, climbs into bed and pulls to covers up over his head. These are the times that I have to stop and question myself. What am I trying to accomplish with this goal? Is there a way to engage him? This morning’s assignment (one of) was to write down subcategories for a topic. The goal here was 1) for him to practice writing and 2) for him to be able to break down a concept into simple parts and create a story. Literally all he had to do was write down five words. We spent a full hour with him trying to explain why he couldn’t do the assignment and me patiently explaining why he could. He excused himself several times. Finally I realized that I was making it harder than it needed to be. While he sat at the table and stared at his book, I went to the craft closet and pulled out supplies. I had planned to make fire starters after the traditional classroom subjects had been completed. It’s a great craft project, and something I could teach Wyatt that would contribute to our families ability to heat our home economically this winter. When he saw the brick of wax, his interest was piqued. So, instead of writing an arbitrary stroy about Sonic the Hedgehog, he wrote about how to make fire starters. An assignment that he could have completed with five words turned into a half of page full of sentences describing the process for making fire starters. He ended up completing not only today’s assignment, which was to identify and narrow a topic (How to make fire starters), then break it down and write the story. Granted, his was a tutorial, but a story about how to play Sonic would have been similar, but not nearly as useful. 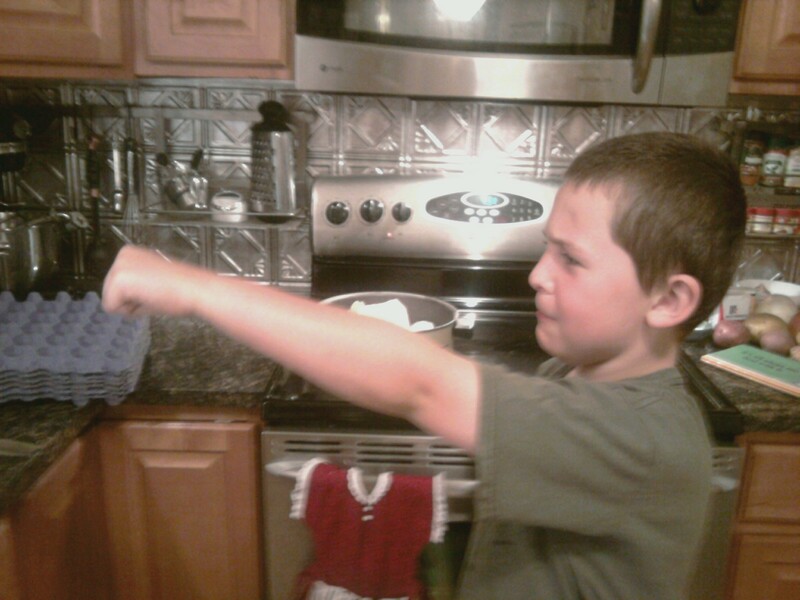 Wyatt doing a super pose after setting the wax to melt on the stove. For those of you who are wondering what the hell fire starters are, let me break it down for you. Fire starters are little flammable bricks used to, you guessed it, start a fire. I make mine using egg cartons (not the styrofoam kind), sawdust or shredded paper, and wax. Step 2: Melt the wax. 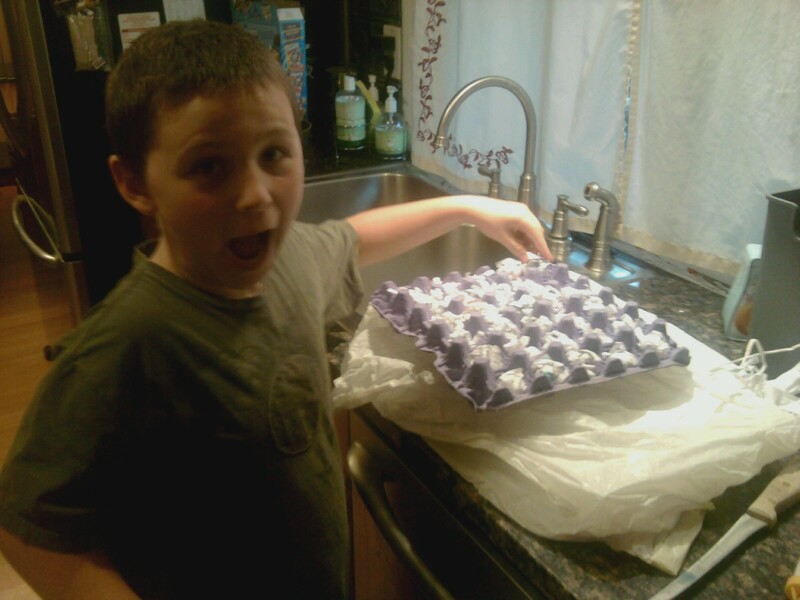 Wyatt filling the egg carton with shredded paper. Step 3: Fill the egg carton with shredded paper (or sawdust). Step 4: Add color or scent as desired. Wyatt chose vanilla bean and teal for ours. Step 5: Fill the egg trays with melted wax. Step 6: Wait for the wax to harden. Step 7: Cut sections apart. I use my jigsaw for this step. Step 8: Light a fire. We made it throug step 5 today. Tomorrow, after the wax has hardened, we’ll cut the sections apart and Wyatt and I will use one to build a fire ourside in our firepit. It’s days like this that I feel especially proud of the progress Wyatt and I are making. We started the day mutually frustrated by his lessons, but together we found a way to make it fun and ultimately did more than the assignment called for. Wish us luck for tomorrow. Next Post What’s a Little Teasing Between Friends? I’m going to put this story in the back of my mind and remember it during times my kids struggle with something and ask if there is a way I can make it more fun and more engaging instead of making them push through. I struggle with this. On the one hand I think there’s great value in teaching children to buckle down and do things that are hard. On the other hand, I think they are children and the only way they will learn that lesson is if they can see the benefit, or payoff, for their hard work. I’m not sure I’m doing the right thing with Wyatt, but we are finding our way together. That has to be worth something.